This is a public Trello board I created in July 2015 in response to a large number of questions on Quora that I was seeing on the topic of inbound marketing, as well as how to execute a marketing strategy on a shoestring budget for startups. At that time, I knew absolutely nothing about marketing. But thanks to vast amounts of quality content produced by the likes of Hubspot, Content Marketing Institute, Buffer, Moz, Quicksprout, Vero and Social Media Examiner (etc, the list is a long one), there are tons of articles, guides, templates available on the internet. And by reading a lot (and when I say a lot I mean A LOT), I was able to pick up the gist of inbound marketing and get Inbound Certified by Hubspot. 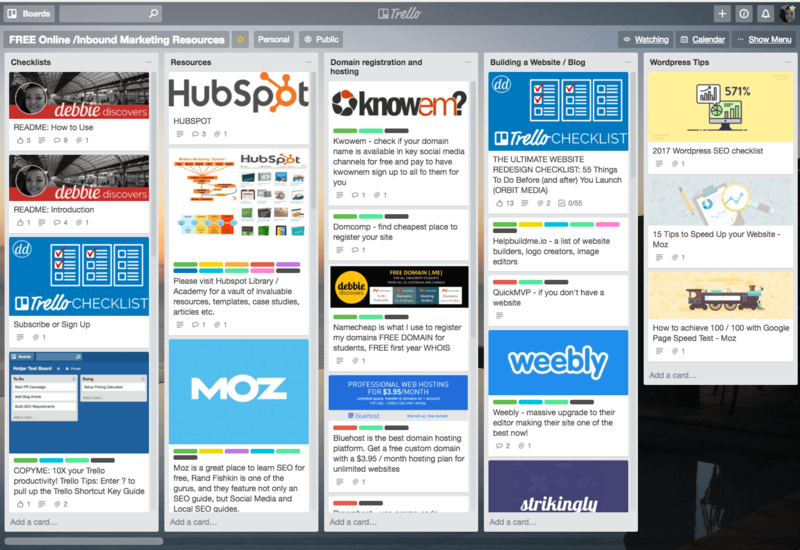 Trello was one of the tools that I learnt about, used by many content editorial teams. But not just content – from SEO to website design to social media marketing, Trello is a superb tool when it comes to managing several moving pieces and collaboration across multiple team members. When I had finished my project with The Learning Lab, I found a Trello card that I had made – a comprehensive checklist of to dos before a website redesign. I thought it would be fun to clean it up, put it on a public board and tweet it to the author of the checklist. So I created a public board just for website redesign and messaged the author, Andy Crestodina from Orbit Media to let him know that anyone of his readers could make use of it. What I did not know at the time was that Andy is one of the top 100 most influential content marketers in the industry as listed by Onalytica. That was quite fulfilling. Why would I share all my research? Many people (especially Singaporeans!) ask my why I would share my Trello Board with anyone. What would I get out of sharing it? Save it for myself. Even worse, what if people criticised it? However, as I was learning about inbound, I have been influenced by three people in particular – who are so generous in sharing their knowledge – that I was inspired to do the same. My second source of inspiration is Jim Daly, Vero’s content marketing head and blog editor. Vero is an Australian email marketing company that is the epitome of content marketing and believes in “giving away all their secrets”. Their blog features a ton of valuable resources for any email marketer. In particular, one piece of “epic content”, their guide on Email Marketing Best Practices: 20 Tips for Dramatically Better Email published in April 2014, resulted in 43,000+ page views and over 300 links. Since then they’ve produced a number of other epic pieces of content. This is a must read resource for any email marketer – where you will find case studies and email templates and examples of companies like Amazon, AirBnB, TripAdvisor and so on.